Focusing on the latest technological developments, M2M Communications: A Systems Approach is an advanced introduction to this important and rapidly evolving topic. It provides a systems perspective on machine-to-machine services and the major telecommunications relevant technologies. It provides a focus on the latest standards currently in progress by ETSI and 3GPP, the leading standards entities in telecommunication networks and solutions. The structure of the book is inspired by ongoing standards developments and uses a systems-based approach for describing the problems which may be encountered when considering M2M, as well as offering proposed solutions from the latest developments in industry and standardization. 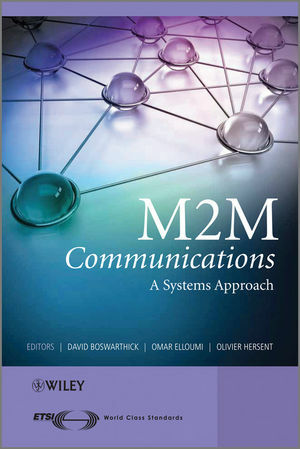 The authors provide comprehensive technical information on M2M architecture, protocols and applications, especially examining M2M service architecture, access and core network optimizations, and M2M area networks technologies. It also considers dominant M2M application domains such as Smart Metering, Smart Grid, and eHealth. Aimed as an advanced introduction to this complex technical field, the book will provide an essential end-to-end overview of M2M for professionals working in the industry and advanced students. David has been extensively involved in the standardization activities of mobile, fixed and convergent networks in both the European Telecommunications Standards Institute (ETSI) and the 3rd Generation Partnership Project (3GPP) for over 10 years. He is currently involved in the M2M standards group which is defining an end to end architecture and requirements for multiple M2M applications including Smart Metering, healthcare and enhanced home living. David holds a Master's Degree in Networks and Distributed systems from the University of Nice and Sophia Antipolis, France. Omar is currently a standardization manager at Alcatel-Lucent. He received his degree in Engineering from Universite de Rennes I.
Olivier Hersent was the founder of NetCentrex and former CTO of Comverse Inc., and previously worked as an R&D Engineer at Orange/France Telecom. He studied finance, quantum physics and psychology at the Ecole Polytechnique from 1991-1994 and is now an independent consultant. The contributors will include the Editors' colleagues from Alcatel-Lucent amongst others. 1.4.1 Which Standards for M2M? 4.2.1 What is a Use Case? 4.6.1 Why Focus on Wireless Networks? 5.6.2 Why REST for M2M? 8.4 Which Types of Solutions are Suitable?